Domaine de l'Arlot (Prémeaux-Prissey) / Sugar of the Century, Bourgogne, Côte d'Or, Oktober 1999. Vogel & Fitzpatrick GbR Black Ink 1998. At the Domaine de l'Arlot Olivier Leriche welcomed us. He is the young head of the technical staff at the domain who has been supporting the domain's general manager Jean-Pierre de Smet for one year now. On a short walk through the park above the old manorial house he showed us the Clos d l'Arlot,the climate that was responsible for naming the domain in 1987. At that time the insurance company AXA bought the land and employed Smet who had arranged the purchase as manager. From the N 74 you percewe how steeply the hill rises to the top. In the vineyard only traditional methods and no herbizides are used. The harvest is brought in by hand, in 1999 from the 17th till the 25th of September, before the rain starts. Olivier Leriche tells us, a harvest worker who has been working at de 'l Arlot's for 31 years was of the opinion that this was the best harvest close to perfection with no mould among the grapes. Such a thing he never had experienced before. The 1999 was chapatlized only a bit. The concentration of sugar is very good, also the acidity, but it isn't that intense. All stalks were left in the mash. At de l'Arlot's wood from personal property for the barrels is bought together with the domain Dujac and it is stored at the Clos de l'Arlot to be dried for two and a half years. Thus best quality of the barrels is made possible. 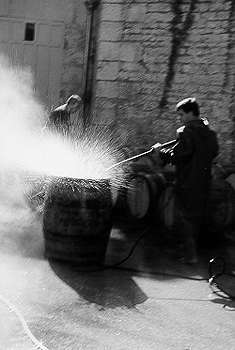 The Der Clos de l'Arlot is filled to 35% in new barrels, the richer Clos de For�ts-St-Georges to 50-60%. 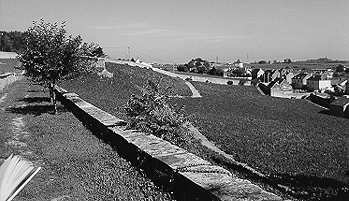 The Clos de l'Arlot and also the Clos de Forêts-St-George are monopoles - vineyards that are owned alone by the de l'Arlot. At the Clos de'l Arlot there is also a white wine very much sought after. The cellar of the domain is rather large and very clean. It seems noticeable that there are only very few bottle stores. Except for a few shelves for bottles that are kept for home consumption almost everything is sold out. Colour of raspberries. In the nose red fruit, raspberries and strawberries. In the mouth the same aromas, smooth tannin, good fruit, soft acidity, very well balanced. Nice Pinot Noir. Extremely shining dark red like cherry juice. Scent of blueberries and plums. In the mouth mature, sweet tannin, good acidity, vanilla and remarkably flint stone. Medium strong, very elegant body. Some cooked fruit. Good wine. This climate meanwhile is sold and now the last vintage by de l'Arlot, because the main focus is now on the wines from the Côte de Nuits. Colour of strawberries. Fragrance of strawberries and flowers, sight whiffs of mixed spices. In the taste also slight tones of spices, a bit red capsicum, slightly hot on the tip of the tounge. Very fine, elegant pino-fruit of the brighter kind. Enduring. Exraordinary Nuits Saint Georges that convinces not with broad strength, but with excellence. Colour of dark cherries. Aroma of blackberries, black currant, dark fruit and also some red fruit and cherry tones. In the mouth good spices, wood, fine and hot tannin, balanced, good acidity, lasting finish. Good and full bodied Nuits. Wine from the young vines at the Clos de Forêts-St-Georges. In the different tones similar to the Nuits before that grows at the same climate with the young vines, but it is a lot more subtle, complex and fuller bodied than this one. We enjoyed both very much.